Plot holes are arguably the most important thing to address first in your novel. Luckily they can be one of the easiest things to prevent, if you pay attention to your book as a reader would. First, let’s look at what a plot hole can be. Are descriptions accurate? Does your character act in accordance with her personality, and interact with others appropriate to her personality? Does she feel like a real person, or too “good” or too “bad”? Is your protagonist consistent in her personality, or does she seem to undergo a change from scene to scene? (This is reaction outside a character’s arc, which should be a gradual change over the course of the novel.) 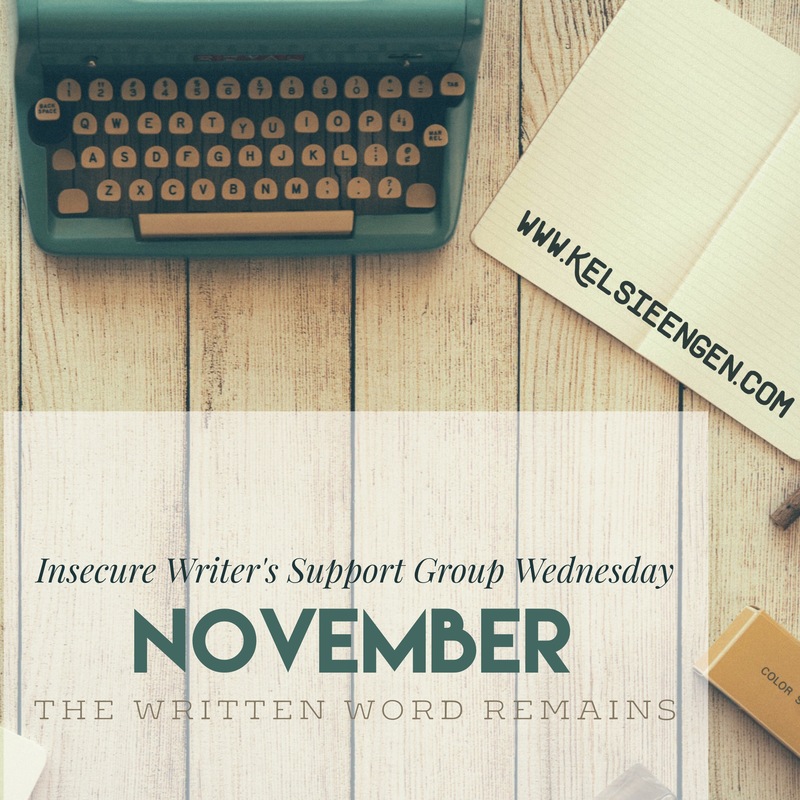 But pay attention to more than just your main character–are your supporting characters consistent and believable too? Does your character kiss a boy and then later say they never kissed? Or does she develop a crush on a boy that a girl with her personality should never like? Or does she discuss someone that she said she doesn’t know or never met but after she’s already met him? Pay attention to small details like that, but also larger, illogical events. Is she alone with the killer when she is way too savvy to end up in a one-on-one showdown with a strange man? Does that career subplot that started off strong in Chapter 2 just as suddenly go by the wayside? Best to fix that. Make sure each subplot you begin is adequately tied off. That means romantic, career, personal, family, friend, etc. You don’t want to have a lot of lingering questions, especially if they constitute a subplot. Even if you’re writing a series, you want to be careful with leaving loose ends, because too many and they can antagonize your reader to feeling manipulated to pick up another book just for answers. Too few, and your reader may not care to read on. Balance and moderation. Is the protagonist’s room in Chapter 1 painted green, and in Chapter 32 pink? Or do you have your characters start off a scene in one setting and then show up in a new setting half a page later? Or does your character say she’s never been to a place, only to show up in that place later on and know her way around like it’s her own home? Do they each have arcs and resolutions? Do they have distinct personalities, way of speech? Or could one minor character be another and no one would care? Although this many not be a true “plot hole,” it’s well worth paying attention to inconsistencies in your supporting characters and make sure that they, like the main characters, are playing according to their logic, personalities, and rules. Is the defeat (or victory) of the antagonist likely? It can be (and arguably should be) a twist and/or surprise without defying rules of logic. In fact, upon inspection, it best be a logical, reasonable defeat–in retrospect–for the reader. If you have the antagonist defeated by something completely out of the blue, the reader may not buy it. Okay. 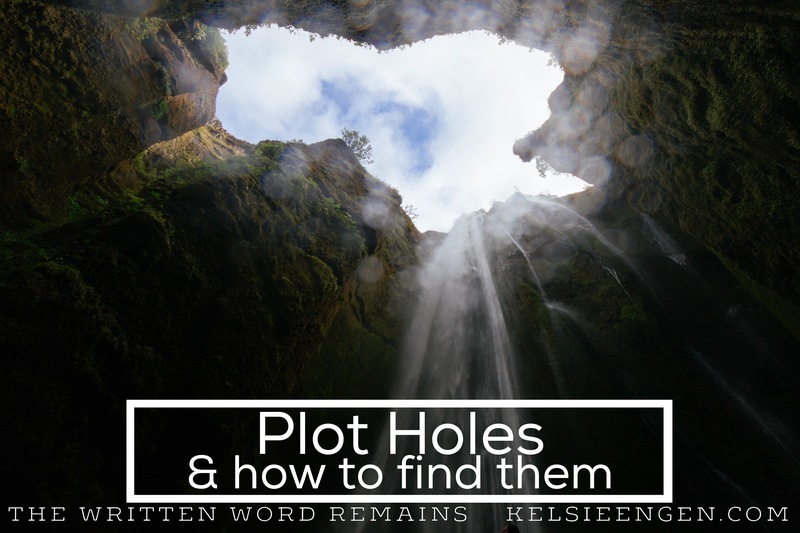 So now that we know what type of things we’re looking for (basically anything that doesn’t make sense or has been forgotten during the writing of your first draft), what are the steps you have to take in order to catch these plot holes? 1. Reread your novel as a reader, but with a sticky pad handy. And try to enjoy it like a reader would. (This is why letting your story rest is so important.) Where are you rushing through to get to the “good” stuff you know’s coming? And where are you slowing down, either to savor or because nothing is happening? What feels unimportant to you? Note all those things and anything else that feels off to you as a reader. You have a lot of things on your mind with revision–so write it all down and make sure you have some level of organization. You never know when you get distracted and have to put your revisions aside for awhile before you can get to them. So make certain that you have a spot where you write down all your thoughts and observations, and file it somewhere you know will be safe, either a physical notebook or a digital one, etc. Now once you reach “the end,” make a note on how you feel setting it down. Did it leave you with the emotions you were aiming for? Yes? Good. Consider if you could make the ending even stronger. No? Time to ponder why not. 2. Focus on the big stuff. This is a very important step–and it’s vital that you do not get caught up in the sentence changing, fine-tuning process. Instead, remind yourself to focus on the novel as a whole, and the scene as a whole scene, instead of word choice or sentence structure. That can and will be addressed at a later date. Is the midpoint or turning point natural for your character? Or is it a forced decision that you, the author, is making for her? Does anything else seem unlikely? Too coincidental? This used to be incredibly hard for me. The perfectionist in me cringed at every misused word, every rough sentence, every imperfection that I could find as I read the story I’d written. I used to edit each paragraph and sentence every time I edited my WIP. 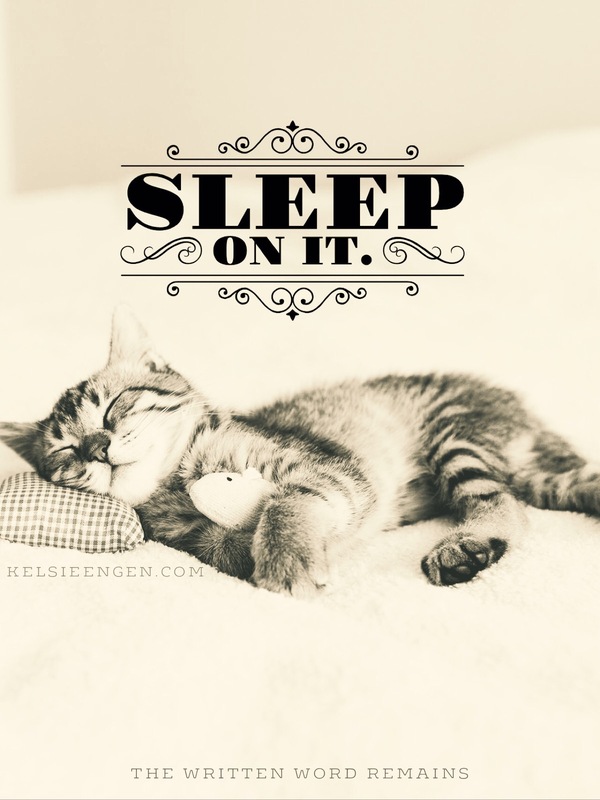 Finally, after editing one of my WIPs to death, and getting so discouraged and tired of the story, I made the conscious decision to STOP IT. Stop the madness. Seriously. 3. Remove yourself from the ability to change your sentences. So how do I remove my ability to edit? I convert my manuscript into .mobi, .epub, or a PDF. I then open my manuscript on my iPhone or iPad and, like I am reading any other book, read it. Using an ebook app instead of printing out my manuscript makes writing comments difficult and annoying. Every time I highlight and have to write a note to myself, it is cumbersome; I have to really weigh the value of doing so. Is it worth the fifteen seconds I need to wait for the highlight to pop up, select the “note” option, then type and retype and fix typos on my iPhone as I read? Sometimes not. So I may leave a highlight (if that), and then move on. I also ask myself if it’s something I will catch when I reread the book later. Is it a misspelling or an awkward sentence? I’ll catch that when I reread later. Is it a repeated word? Well…maybe. If I’m paying attention, I’ll catch the repetition. But most of the time, I’ll highlight the instances of the repeated words so that I know there’s something amiss. 4. Consider each scene with a critical eye. Does every scene pull its weight? Does every scene pull double or triple duty? Does it advance plot but also reveal your character and create conflict? Now’s the time to check. If your attention is wandering during a portion of your book, ask yourself why. Is it lacking action? Is it wandering from the plot? Are your characters too boring? Do you need to pump up the conflict? But most of all, ask yourself if your story really needs this scene. What happens in it that makes it essential to the book? How, if you removed it, would your plot line suffer? Sometimes characters don’t develop in the way we, the author, wants them to. Sometimes we try to force them into a square shaped hole when they are most obstinately not square shaped. No, they’re more like star shaped, especially some of those minor characters who steal the show. That plain Jane on page 5 may be anything but that; instead she steals the spotlight from your MC. Now in some instances, that’s fine. A scene-stealing minor character can be great fun and provide comic relief or can distract from the plot and theme you wish to impart on your reader. You may want your minor character to steal a scene and deflect from the MC in a moment when the MC is less than amazing or less than likable. However, you probably don’t want that to continue throughout the book. In most cases, your MC’s character arc should be the one whose arc takes front and center. And if this “minor” character is a sidekick, you run the risk of the reader caring more about the sidekick than the protagonist. In nearly all cases, you don’t want your sidekick to be a better protagonist than your actual protagonist. So reevaluate your characters as you read, and make sure that the focus is where you want it to be: on the main story. Yes, the antagonist is a character, and could fall into number 5. But he’s more than a character. He is everything your MC is fighting against. As you read, keep your antagonist in the back of your mind–always. Is he there, wrecking havoc even when he’s not on the page? Is there a way to make his effects (and presence) felt more? There is a lot to consider during revisions. That’s why there’s no way you’ll be able to address everything in one revision. But don’t get discouraged. Multiple revisions are a name of the game, and if you get stuck, have a writing buddy read it for you and help point you in the right direction. 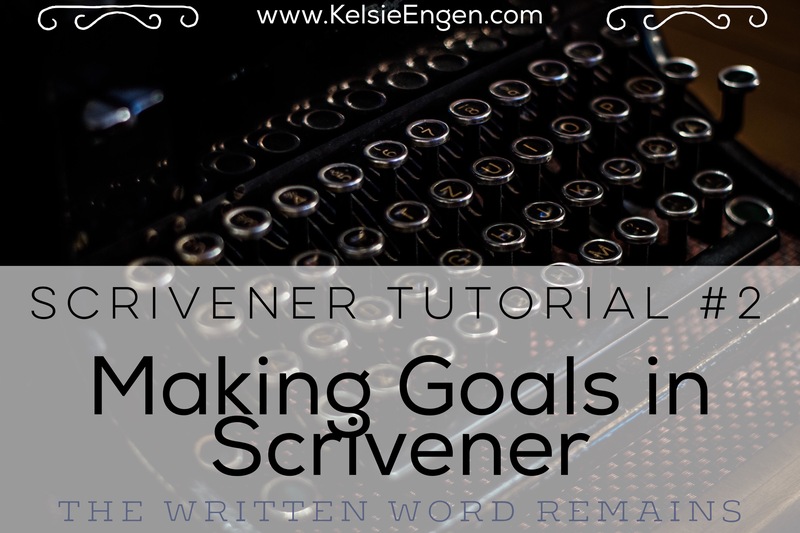 I’ve been using Scrivener for about three or four years now, and I consider it one of the best writers’ tools out there. I don’t consider myself a technophobe, but I’m also not a techie. I can usually figure new programs out, but I know nothing about computer programming or anything like that. 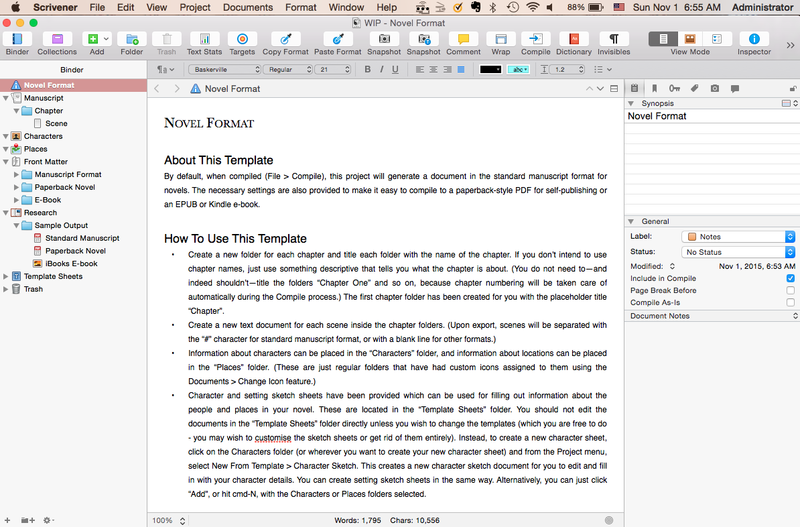 I’m honestly an average user of Scrivener. 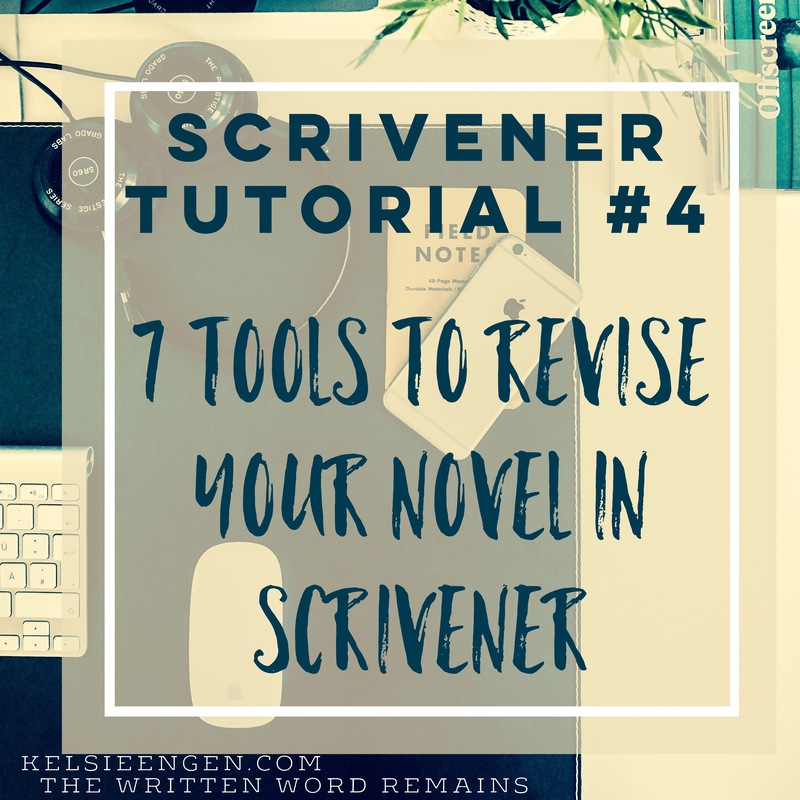 I haven’t taken a class on Scrivener (although I have watched a couple of tutorials for certain tasks, such as compiling/exporting my document, syncing my documents, and other formatting tips). Instead, my knowledge about Scrivener has come from spending time in it, typing my novels in it, and exploring its uses. Now there are a lot of author blogs out there where the author says they bought & downloaded Scrivener (or downloaded the 30-day free trial), and simply never opened it. It either looked too intimidating or they just didn’t feel motivated enough to try it. Well, stop that right now. 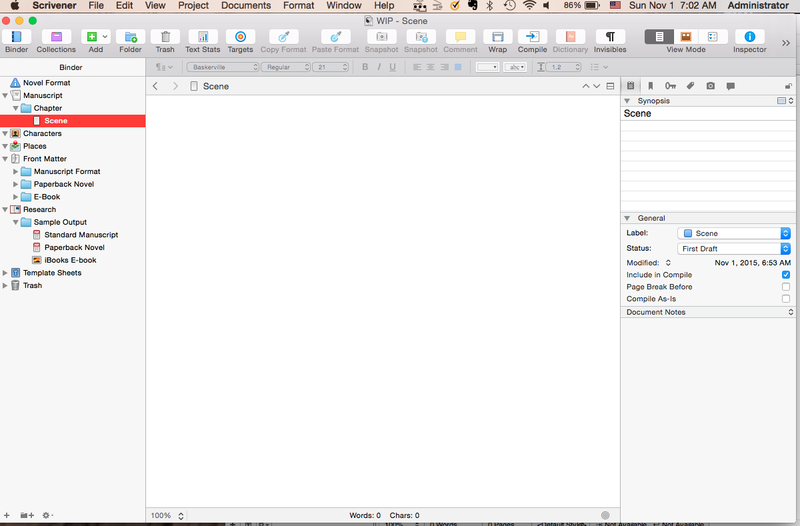 Go ahead and open Scrivener–there is nothing to be afraid of. In fact, you will quickly realize that it’s much better than writing your entire novel in Word or TextEdit or Open Office. Trust me. And you know what, if you can’t shell out the $40 or something it is for the full version, win a NaNo event and there’s usually a coupon for winners that awards about 20% off or something. It’s worth it. 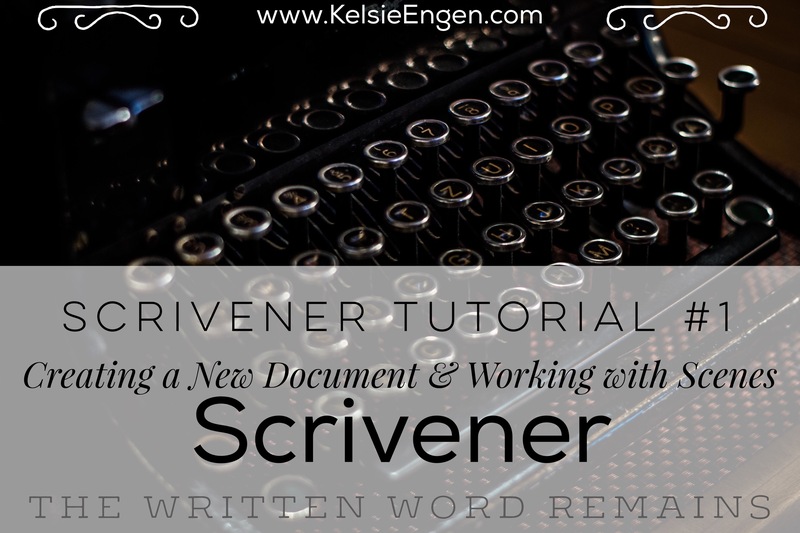 So let’s say you just bought Scrivener and you just opened it. This is what Scrivener gives you when you open it. Choose one. Or you can open an existing file, or a recent file, etc. 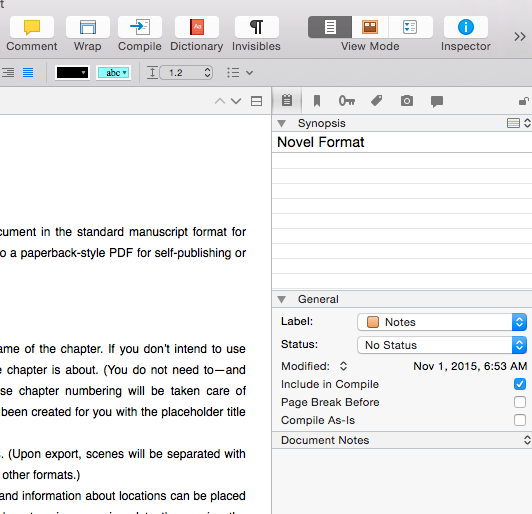 With Scrivener, it never hurts to open the User Manual and take a peek. You might realize you needed to know something that you never thought you did. So if you feel so inclined, take a scan, but don’t spend too much time there. For me, at least, when I open a user’s manual, I’m looking for something specific, and getting bogged down with every single thing I can do with a program is more than I need–especially to start. 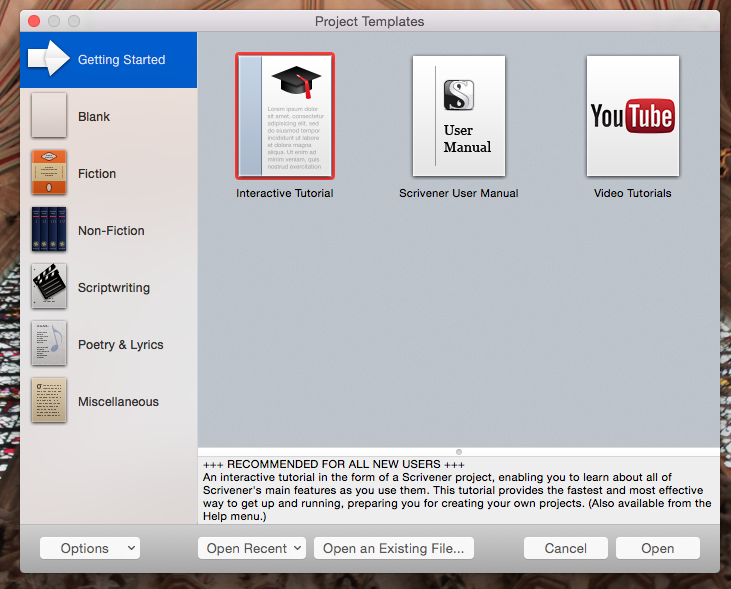 You know what–everything Scrivener does is probably more than you need too! Now what you’re seeing are templates for certain formats of fiction. I have a couple that I’ve downloaded over the years (NaNoWriMo offers one, and I downloaded one to coincide with Aeon Timeline, another program that can come in useful for authors), but you don’t need to worry about the ones I have that you don’t see on your screen. You’ll probably see three: Novel, Novel (with parts), and Short Story. Pick your poison. 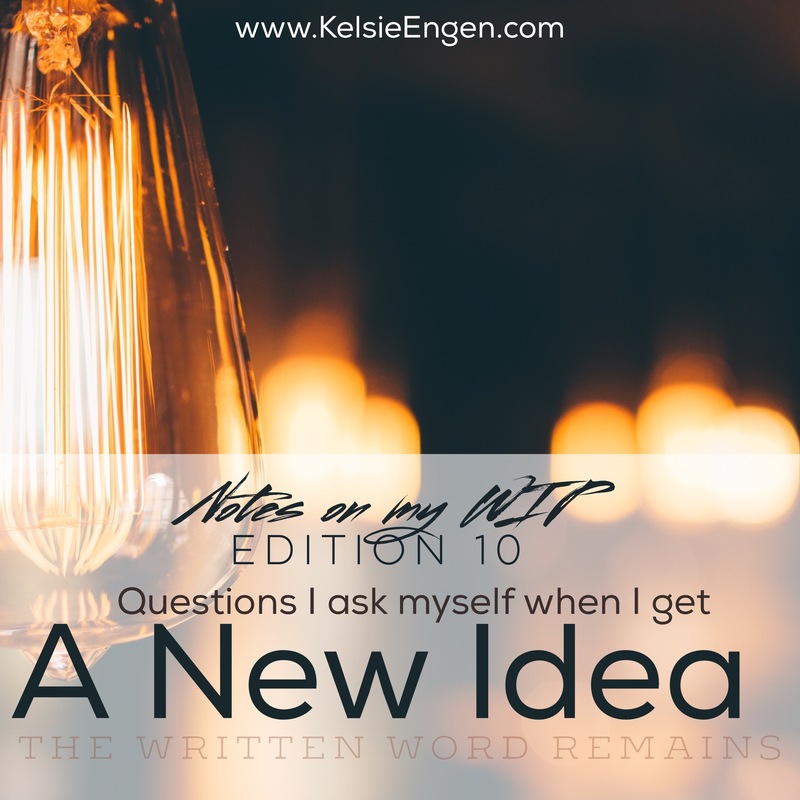 So you have to choose–but even if you start your novel in one format and realize you needed to have a novel with parts, or vice versa, you can change things around later. Click “Choose…” to open a new project with your selected template, choose your file name and the location you want to save it in, and you’ve got a new project. This is what’s called the “index card” view. To start writing your novel, find the “view mode” grouping of buttons on the upper right of your screen and hit the far left one which looks like a sheet of paper. This will put you in the page view mode for your manuscript, which you can then begin writing your novel! While in page view, you can just click on the “scene” button under the “Manuscript” and begin to write your first chapter. From there on, you’re free to type as you see fit. You may immediately name it, or name it at a later date by a delayed double click on the scene title in your binder, or by clicking on the title directly above your page where you write your scene. A third way to name your scene is in the Inspector, underneath the Synopsis area. Adding and naming a scene allows you more ease in rearranging your novel at a later date, also allowing you to easily find a section of your novel, especially if you name it something descriptive of its events. 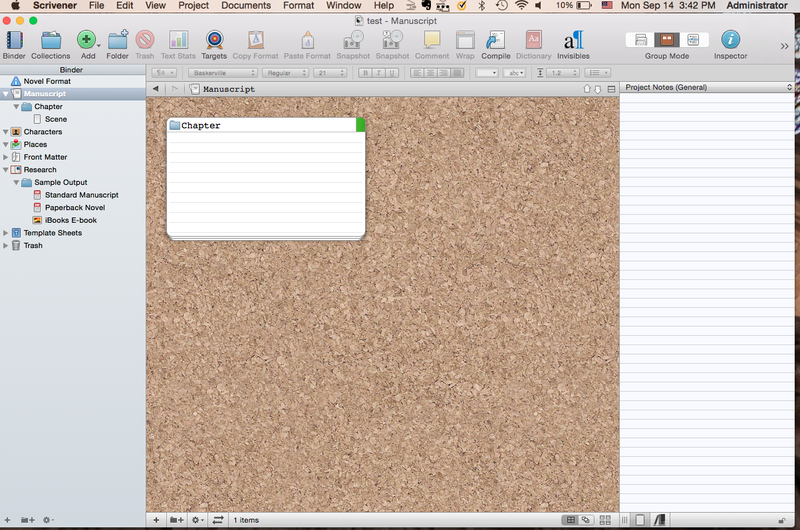 Also, when you write your novel in scenes, you can enter corkboard mode and easily see your novel’s outline and shape. 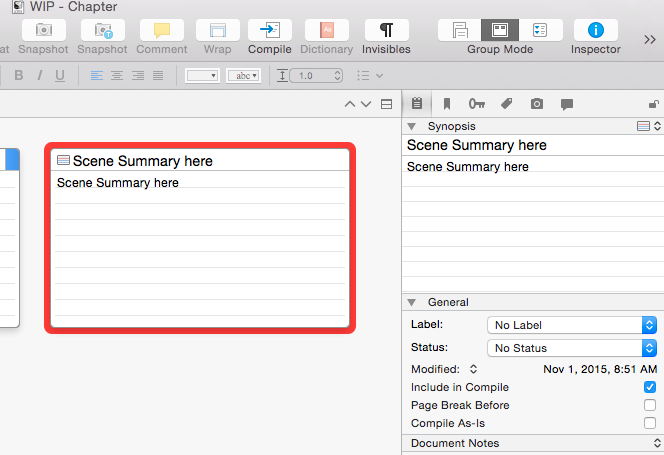 If you are the type of person who likes to have a scene summary at the tips of your fingers, Scrivener does that too. To the right, in your Inspector, there is a notebook looking button at the top. Press that and you’re given an area to write a summary for your scene, a summary which then appears in the corkboard view of your screen. If you create folders for your scenes, which are akin to chapters, when you look at your entire manuscript in the corkboard view, you will see the cards and summaries of your chapters, not your scenes. So if you wish to only see your scenes when you lay out your entire manuscript, you might want to group your scenes into chapters at a later date, as when you are looking at a finished first draft and want to export the file. Are you a Scrivener fan or phobic? Let me know why in the comments below! 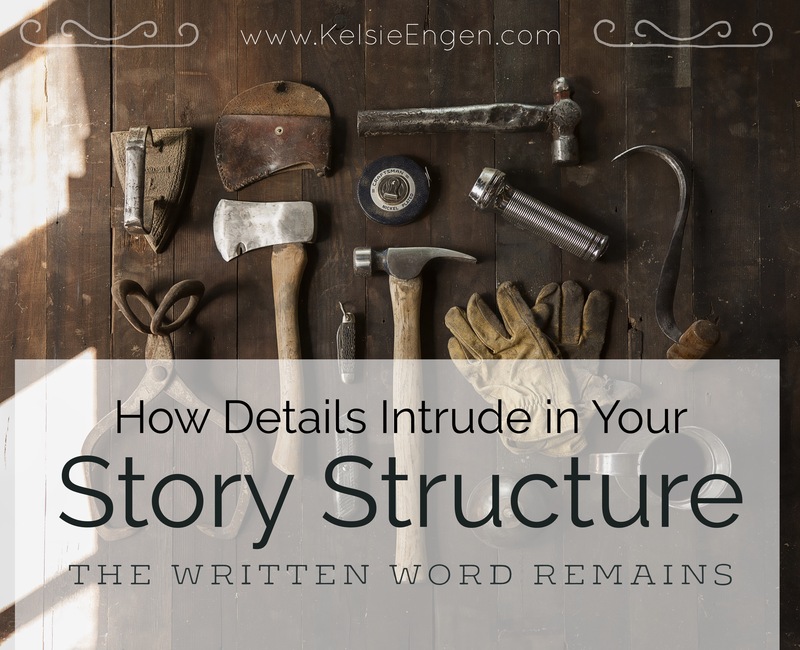 Details are a wonderful way of bringing authenticity to a story or novel. In police interrogations, sometimes it’s the details which prove or disprove a person’s involvement in a crime, like what color was the car or the person’s hair? It’s the same with a novel. If an author doesn’t know the color of her MC’s hair, what faith is the reader going to have with the author to spin a plot without similar holes? The structure of a house is often used as a metaphor for the structure of a novel. Structure is something that is not seen, and yet it’s irremovable from that which it holds up. A novel is the same way. Most readers don’t see the structure, don’t see the 2x4s, the nails, the screws, the concrete foundation which all go into building the novel. But those tools are far from invisible in a novel–less invisible than they are in a house. In fact, if you look closely enough, you can begin to pick out the tools used. These are the details introduced in a novel, the tone, the word choice, the personality of the characters, the blank space on the page, etc. All of these details act together to form a novel that is intended to portray a certain message (i.e. theme). Sometimes if one assumption or one detail is wrong in a story, the entire house crumbles down. The structure can’t hold it up. That’s why it’s so important for us, as authors, to do the research needed to support our novel. It doesn’t have to be historical research, but if you write dystopian or historical fiction, you’d best know the history you’re trying to change. If you’re writing science fiction, you’d best know the science you’re trying to fictionalize. Even fantasy must have an element of believability. Fiction must be more plausible than truth, or else those details are going to intrude more than ever. So how do these details distract from a reading experience? All too often, when an author has done a great deal of research for a novel or story, it’s obvious–and obvious in a bad way. These are the books where paragraphs of description follow paragraphs of description. Instead of a little sentence here about the setting, you get eight sentences in a row about setting. You get so much description about the hair salon setting or the history of nail polish that you could write your own book. Did you need all that? No. Rule of thumb: if it doesn’t add to the scene by developing characters, allowing the reader to glimpse just what they need to anchor themselves in the scene, then cut it. 2. Comes off as a defensive soap-box of information. If you’re writing sci-fi or a book which takes a controversial viewpoint, the book in all its research could come off as defensive. Mountains of description or non-story rabbit trails can meander away from the story you’re telling and instead try to lead the reader to the viewpoint you want them to have (yours of course). Rule of thumb: cut the rabbit trails. And if it doesn’t show up in the theme of your story, cut it from everywhere in your story. You don’t want your reader to feel hit over the head with the author’s viewpoint (or even a character’s opinion). Make the character’s stance known, forget your stance as an author, and let the theme and events speak for themselves. As above, if it doesn’t advance the plot or develop characters, cut it. 3. Eclipses the story itself. There are some books that should not be fiction books. They read more like a how-to of building a house rather than a fictional story of a character building a home which is told to amuse readers. If you’re writing to inform, that’s one thing, and while fiction can sometimes inform, the best fiction puts information third (or fourth) behind characters, plot, and theme. 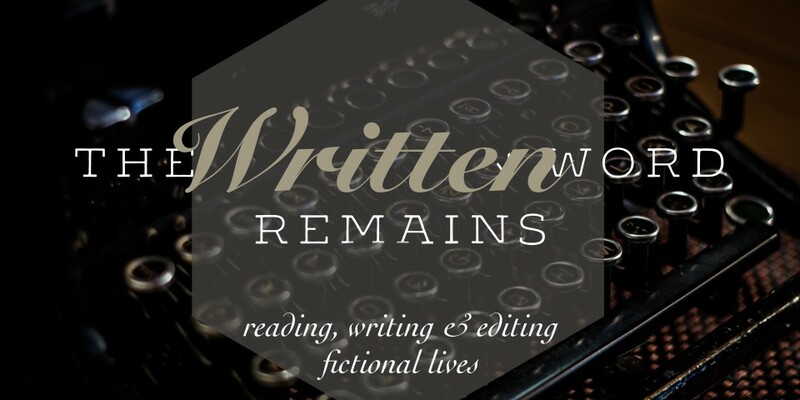 Rule of thumb: if a beta reader tells you that your book is dry and needs more for the characters to do, as well as being heavy on description, maybe you’ve got this issue of research or details bogging your story down. Lighten up on the details and let the characters create action on their own. Now these are just a few of the ways too much description can affect a reader’s experience with a book. What are some ways that you think detail intrude in a story? Comment below–I’d love to hear your thoughts on the subject! Have you ever gotten such a great idea that you simply cannot wait to start writing it? At the time, it seems genius, as though no one else could possibly have come up with this idea, even if it’s highly likely that someone has. But no one can do it better than you, right? Ah, this has been me over the past few days. While I was trying to nap the other day, my mind wandered, and kept wandering, eventually landing on this stellar idea about [redacted]. That’s right. I’m not sharing. Well, I can share a little bit. What I have in mind is a retelling of three rather famous fairy tales. And since fairy tales are public domain and well known, I plan to manipulate them to make their stories something different and unique and totally exhilarating. Suffice to say that I think it’ll be pretty fun–both to write and (when I’m finished) read. So the past few days, since this epiphany occurred to me, I have been madly plotting, going so far as to abandon other writing projects (which were formerly so exciting) in order to write all this stuff down before I forget it. I want to develop it and summarize and have the story down before it slips through the cracks. Quite predictably, there already are doubts and issues to iron out surfacing as I begin to plot. There are a lot of characters to balance in this storyline, at least nine main characters right now, and it’s a rather confusing plot line because I have to keep the three stories straight but also allow them to strategically intersect. Unusually (for me) this is geared up to be a trilogy, whether self-pubbed or traditional, the trilogy is rather essential to the plot, as all the characters, although having their own storylines, become inextricably mingled with the others. So it’s a matter of plotting out the details far before I write the stories. If I don’t, I know that I will be spending years hammering out the details on these projects and possibly screw myself over in a second storyline. I have to figure out how the characters interact, when they interact, what happens while one MC is doing one thing, another MC is doing something else, etc, down to MC number 9. Since embarking on this journey so few days ago… I’ve already learned a few things. 1. I need a good timeline. I plan on writing this as three concurrent books, that is books whose plots are occurring at the same time, which presents a difficulty outside of a normal trilogy. In order to keep key events straight during writing, I have to know when things are supposed to happen, especially relative to the other character’s plots. So this means I have to know all three stories I plan on writing, and how they line up with the other stories. For example, To keep track of everything, I plan on using the Aeon Timeline program. 2. I need to know the story. And I need to know it well. While it may sound boring to read a trilogy with three plots running concurrently, rest assured that it shouldn’t be. These three stories will be told from three alternative points of view, and although the characters interact with each other–occasionally–all the characters are not main players in each of the plot lines. In actuality, while they have to interact at times, joining up at some times and going off at others, they are each enjoying their own story while another enjoys hers or his. But I do think that will be the fun of it–each story will be familiar enough to recognize, but unique enough to enjoy fully. 3. I have to know the endings. It may seem like if the stories run concurrently, I’ll only have one ending, but I don’t plan on that being the case at all. Each MC will have a unique ending, thanks to subplots and other events that I throw in their ways. 4. I have to know my characters. In order to make sure the characters will eventually do what I want them to do, I have to know that they are people who would act in the way I want them to. In other words, if I want my male MC to fall in love with my female MC, I have to match them well from the beginning to make it believable. No Ron and Hermione pairings here…at least, I hope not. 1. What is expected? How can I alter those expectations or turn them on their heads? 2. How can I foreshadow future events? 3. How can I make this unique and different from anything I’ve read (or written) before? 4. What time period am I going to set these characters in? 5. How can I make the characters my own? 6. How can I make the most conflict between these characters? 8. How will these characters interact with each other? How will the characters interact with their world? 9. Am I using the setting to my advantage? Can I make it work for me and make the story dependent upon the setting? 10. What is the backstory of my characters and the history of their homes? These are just a few of the questions I’ve been turning over in my head and scribbling answers to over the past few days. There are a million more that I have to address before I can really set to work on this story. But right now, I’m allowing my enthusiasm to take me away (because it feels less like work that way! ), so that when I come back to it in the future, I’ll have a solid foundation built. How do you start planning a story? Do you just sit down and write? Or do you take a step back and let it brew?